Three interlinked water storage tanks are to be used for collecting rainwater from the roof of a Bus station as part of an ecological project right in front of the Ecological university in the town of Zvolen – Slovakia. 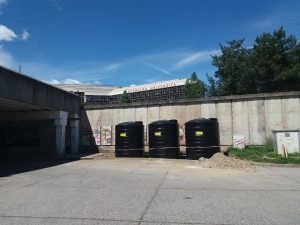 Water from the tanks will be used to water more than 6000 flowers planted. Our customer is very happy and is already planning to add 1 or 2 more tanks when more flowers have been planted. What else can I do with Rainwater? Rainwater can be collected and utilised for a variety of different applications including washing cars and watering plants for domestic use to feeding livestock and crops for agricultural use. The amount of rainwater you can collect can vary greatly dependent on a range of factors including the size of the roof and the amount of rainfall we receive. It is therefore important to consider the size and location of the tank to be installed. To help determine how much water your roof could collect thus the size of the tank you might require then our technical sales team will be able to use their magic and calculate this for you. 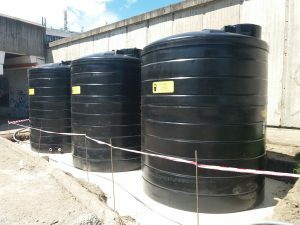 What type of water systems are on offer from Tuffa Tanks? Here at Tuffa Tanks we can offer a vast range of water storage vessels in sizes from as little as 1350 litres up to 20000 litres with the benefit of connecting them to create even larger capacities. View the range of water tanks or call our sales team on 01889567700. Alternatively, you can fill out an online form.